Improvising bassists, Montreal’s Raphaël Foisy-Couture and Toronto’s Michael Lynn are on tour across Ontario and Quebec, infiltrating the local scene, shaking things up a bit, performing with local musicians. In Hamilton they will perform with improvising guitarist Chris Palmer, plus Faster, a post-post-modern improvising duo from Montreal and New York area. An important contributor to the vibrant Montreal improvised music scene, Raphaël Foisy-Couture has been presenting his raw and highly physical approach to the bass in venues ranging from punk lofts to jazz clubs since 2012. Raphaël’s authentic, uncompromising, rapidly evolving, genre-defying playing, DIY attitude and overall openness to surprising sounds have made him a sought-after player on the scene. Always eager to break new grounds in musical comradeship Raphaël collaborators have included an eclectic mix of musicians such has local improvise music fixtures Nouveau Jazz Libre du Québec (NJLQ), Ellwood Epps, John Heward, Craig Pedersen, Yves Charuest, , Ivan Bamford and Simon Labbé , rock and experimental musicians Roy Vuccino (PYPY, Red Mass), Samuel Bobony (Black Givre, Avec le soleil sortant de sa bouche), Jonathan Legault (Loose Pistons, Style shuts) and Philippe Vandal (Orian, VNDL), multi-disciplinary artist Belinda Campbell and international players Jeff Henderson (NZ) and Faye MacCalman (UK). In addition to his frequent ad-hoc music performances he can be heard in the projects Ninja Simone, Bord à Bord and Mettler/Foisy duo. As a grassroots organizer, Raphaël has been involve in the La Passe collective, co-running the Mardis touscroches and Philippe Foisy et les amis dudimancheseries and presenting cutting-edge local and international artists. He is also the creative director of the Small Scale Music label; another means to develop a stronger sense of collectivity for challenging and life affirming music. 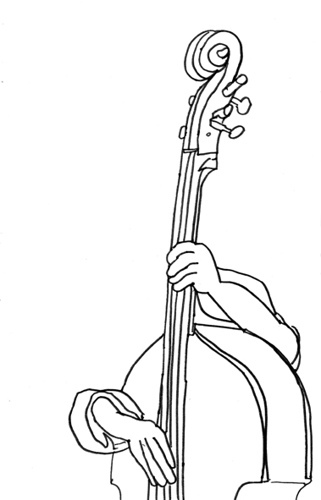 Michael Lynn, an improvising upright bass player, has been active both within the Brisbane, Australia and Toronto improvising music scene. He has played in the Now, Now festival and winter tragic festival (Australia), the New Music Marathon (Dundas Square), the Somewhere There Festival and the 416 Festival, and he is a regular player for Somewhere There, the Array Sessions and Coexisdance. He is currently a member of the NourbeSe Phillips’ Zong Ensemble and Colin Anthony’s Dream Dance, and the Birth of Troubling Forms. For the past 2 years he has curated a monthly improvising music series Audiopollination at Array Space. Chris Palmer is an improvising guitarist in Hamilton, having moved to Canada from New Zealand where he was active in the Wellington avant music/ theatre scene for about thirteen years. The duo FASTER is Kayla Milmine (soprano sax/vocals) from Montreal, and Brian Abbott (guitar/electronic effects/junk percussion) from the New York area. They play a mixture of freely improvised music, reharmonized (and often hilarious) jazz standards, and punk songs in the style of Ella Fitzgerald. In addition to music they also venture into performance art in their live sets and have been spotted performing with popcorn poppers, and doing onstage carpentry to frightened, confused, and ecstatic audiences.